Erik Burnett-Godfree provided just the sort of enthusiasm we were looking for in at 8pm on a Friday night, the numbers had by the time of the talk swelled from 40 for the AGM, to more like 70 for Erik's talk. He began by setting the date, the 22nd of November in history, it's St. Celia's day, and also the anniversary of the death of JFK, Aldous Huxley and CS Lewis, and several other things. Erik then rapidly rattled through his CV before moving on to our 'fantastic collection of 20th Century British art. He outlined the role played by three key people in acquiring the collection: Harold Jolliffe, Borough Librarian from 1946-68 who thought in 1963, it was time we had an art gallery in Swindon. James Bomford, after loaning the greater part of his collection to Harold Jolliffe, announced he was giving it to Swindon. The third person mentioned was Richard Morphet, long associated with the Tate Gallery, firstly as a curator, later as Keeper of the Modern Collection, he advised on acquisitions for 30-40 years. He was given a small purchase fund, and went shopping for modern work produced by artists creating reputations. One of the conundrums now is how we can afford to fill in the gaps in the collection, one way would be to encourage works to be gifted by collectors who would like their works to sit among our collection. LS Lowry's long line of people entitled 'A Procession'. Edward Wadsworth's 'Bright Intervals' seen above is a particular favourite of Erik's, it's a super realistic painting with many contradictions. John Hoyland's application of paint in 'Trickster' is in complete contrast to Wadsworth's smooth application. The final painting he talked about was Maggie Hambling's 'Descent of the Bull's Head'. 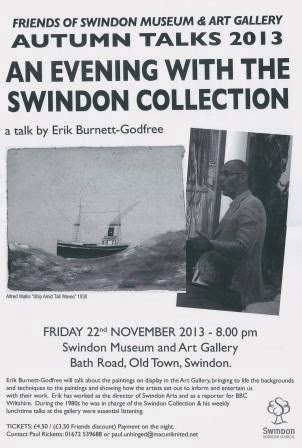 After the entertaining and informative talk, we anticipated thanks from Paul Ricketts, but there was added excitement in the shape of Mike Pringle who had nominated Erik Burnett-Godfree for a Swindon Does Arts Hero Award. Here he is rather far away receiving the award. And afterwards holding it in his right hand and moving too quickly, so he and Mike are blurry. Lastly, I have included 3 photos which give an impression of the numbers of people who attended the talk last Friday. It was a great evening, our thanks again to Erik for coming along and inspiring so many. The 20th AGM of the Friends of SM&AG was held last Friday at 7pm. There were about 40 people present, it felt almost crowded, I have tried to take a photo to give an idea of the numbers, but because of the way the seating was arranged, it wasn't easy. I have included 3 photos giving slightly different views. After the main business of the meeting, Helen Miah, recently appointed team leader of the M&AG, talked about 'the way forward'. 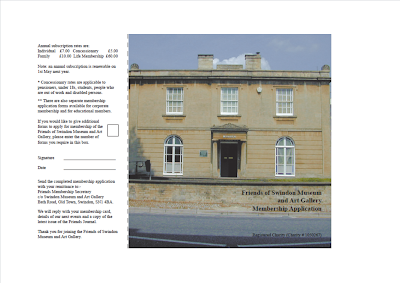 This involves looking at the possibility of building a new museum and art gallery in the town centre on one of a possible 4 sites to be decided on the 11.12.13 at a council meeting. 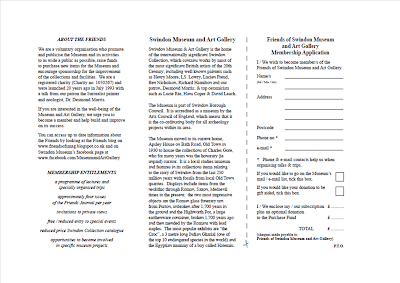 In the meantime, there will be new exhibitions, starting with an abstract exhibition next January. Those who couldn't attend the AGM will receive a copy of this report. 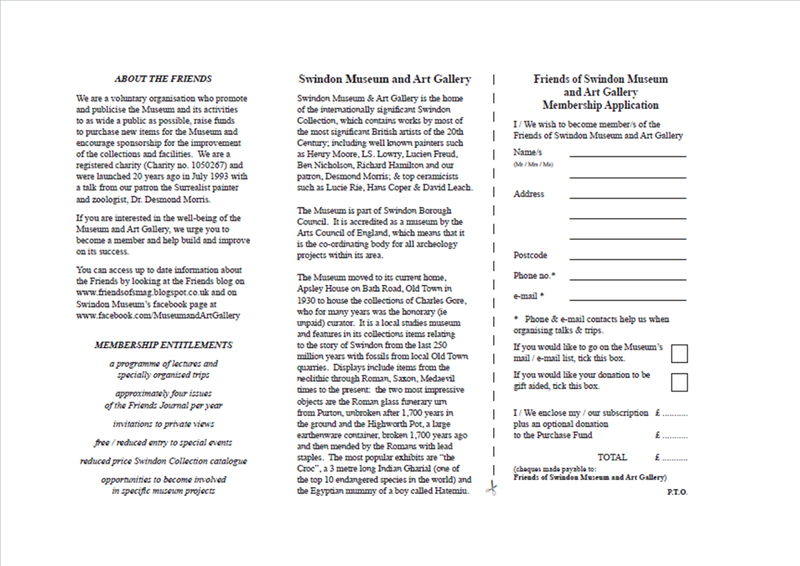 The talk is at 8pm and follows the Friends' AGM which starts at 7pm, both are being held in the gallery. Tickets for the talk cost £3.50 for members and £4.50 for non members, they are available from the reception at the Museum and on the night. 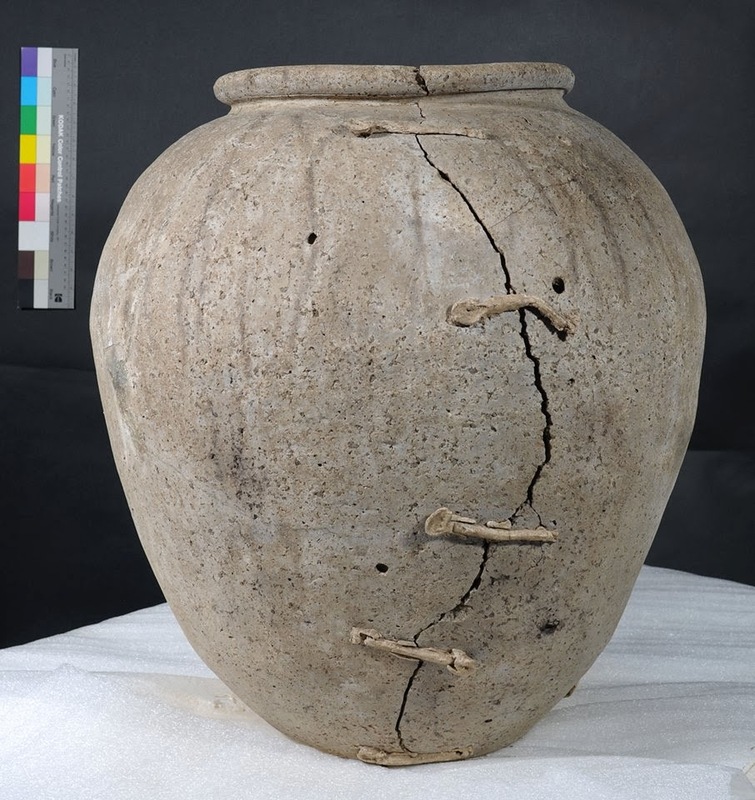 It seems that the Highworth Pot has been talked about for a long time, it was found in 2008, and has undergone several procedures at the Wiltshire History Centre, including analysis of its contents. Come along and see the Highworth Pot soon. 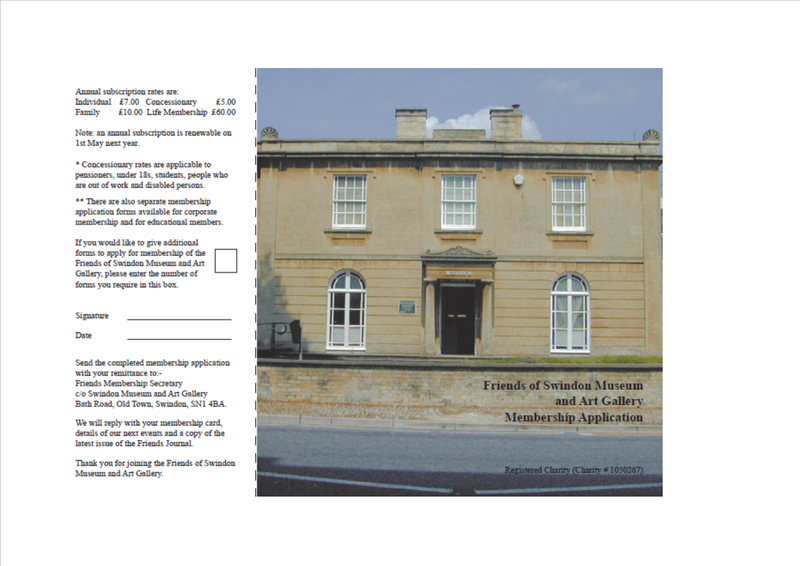 The Friends of Bristol Museums, Galleries and Archives visited the Swindon Museum and Art gallery on Friday afternoon, after lunch a Heelis, the National Trust headqueaters. There were 44 of them, so they were divided into two groups, while Sophie Cummings, the curator of SM&AG showed half of them round the gallery, the others looked round the museum. It was interesting to hear the gasps as people came into the art gallery and saw the paintings on display. After Sophie's talk, it was interesting to find out more about the Bristol Friends; the membership is about 800, they seem to be a very active organisation, something to aim for in the future. Above people looking round, there were complaints that the labelling was hard to read where it was low down, two people can be seen trying to read a label.